Because of my background in advertising, I've always enjoyed watching the Super Bowl for the entertaining commercials. Now I love just about all of it - the game itself, the commercials and the halftime show. I actually loved Justin Timberlake's performance this year (apparently not the most popular opinion, but oh well! ), but what I did not love at all were his outfit and the backup dancers' outfits. They could have been done so much better, and with better color choices. A day or so later, I learned on Instagram that at least Justin's outfit was made of vegan materials, and that it was designed by Stella McCartney. Y'all know I love some sustainable, vegan and fair-trade fashions, but I still can't get behind this styling. I'm not very educated on Stella McCartney as a brand, although I know they are very committed to vegan materials and sustainability in general, and that's something I deeply respect from a more mainstream brand. I dearly hope that sustainable fashion becomes more mainstream, but what I'm afraid of is that people are going to equate sustainable fashion to ugly fashion. And that's simply not the case! There's so much beautiful fair-trade, vegan-material and recycled-fabric clothing available, and the fact that it's kinder to the environment and the workers makes it all even better. What did you think? 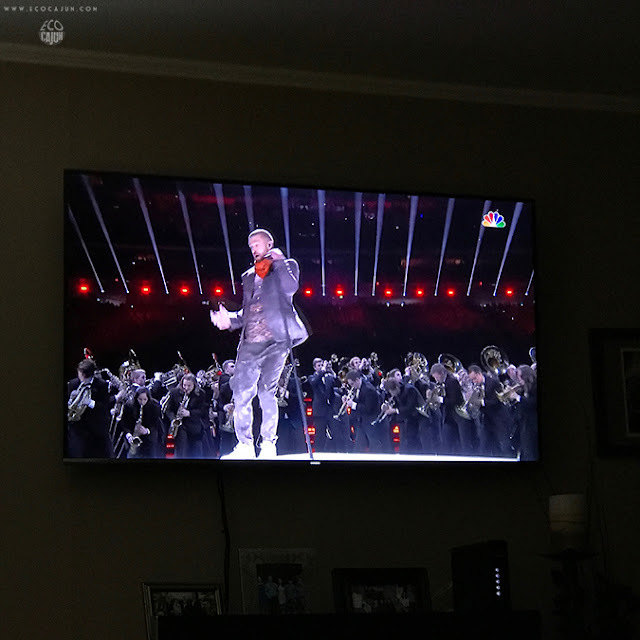 Were you a fan of Justin's Super Bowl performance and style? ?